Under the Chassis - There are still more molded capacitors located under the chassis but they are easy to see and most are easily accessed for replacement. There are usually a couple of "bath-tub" dual capacitors that have two .05uf 600wvdc capacitors internally mounted. It's easiest to just replace these with individual "Orange Drop" capacitors. These "bath-tubs" are PCB oil-filled and present possible health issues when rebuilding is attempted. It's best to just replace these dual .05uf "bath-tub" capacitors with modern types. Sometimes one of the .05uf dual capacitors is used for the AC line filter but dual .01uf capacitors were also used on some later receivers. Also, there are two black (sometimes silver) tubular capacitors mounted against the front of the chassis on stand-offs. These are .25uf for the AVC delay in CW mode and .05uf for the Noise Filter circuit. These can be replaced with appropriate "Orange Drop" capacitors. Resistors - It's a good idea to check ALL of the resistors and replace as necessary. It's common to find a few, if not several, burned resistors in an un-rebuilt SP-600. The molded capacitors have been leaky for decades and any operation of the receiver for extended periods of time will end up overheating many of the resistors. The leaky capacitors have caused the resistor failures - there is nothing wrong with the original resistor wattage ratings. I have actually found 2W resistors installed in place of burned 1/2W resistors while the "leaky" molded capacitor that caused the original problem was left in the circuit. The receiver, when operating correctly, is designed to work with the specified resistors and there is no need to "out think" the radio engineer by installing higher rated parts. Rebuilding the Electrolytic Capacitors - The SP-600 uses a triple 20uf electrolytic B+ filter capacitor with a built-in resistor connected between the negative terminal and the capacitor's metal case. The way in which this electrolytic capacitor is connected, with negative connected to chassis, eliminates the need for this particular internal component (it isn't shown on the schematics either.) These were extremely high quality electrolytic capacitors and many are still fully functional today. If you want to use the originals, then check them carefully for leakage and then reform them if the receiver has not been powered up for several years. Also, most SP-600 receivers have several 10uf electrolytic capacitors that are mounted in "bath-tub" containers. Again, these were very high quality units and many are fully functional BUT check them carefully. If you feel uncomfortable using 50 year old electrolytic capacitors (and maybe you should,) just replace them. I usually install the new electrolytics inside the original housings since it results in a much better under-chassis appearance. The B+ filter capacitor rebuild involves cutting the can of this triple 20uf electrolytic to remove the old capacitors inside. Mark the can before cutting to assure it goes back together in alignment. Cut slightly above the base crimp. Once the cap is in two pieces use a heat gun to get the black tar hot enough that the old insides just slide out of the can. The same treatment will remove any black tar in the bottom piece that has the bakelite terminal base. Wear heavy gloves when using the heat gun. Once the can is cleaned out you can install three new 22uf 450wvdc capacitors with the negative leads tied together. You will have to stack the caps as seen in the photo to the right for everything to fit into the can. Use sleeving to insulate the leads and electrician's tape to hold the three caps in alignment. You'll have to drill four small holes (.060") in the bakelite base of the capacitor near the terminal posts to allow the new capacitor's leads to be connected to the proper terminals. You'll notice that the terminals that are on the inside would make great connections but unfortunately they are made out of aluminum and can't be soldered to. Don't drill through the aluminum as it is so soft it will clog the drill flutes and break the drill bit - drill through the bakelite. Wrap the new capacitor's leads around the proper terminals and solder. Now you'll have to join the top of the can back to the base. Use some paper card stock to act as a backing for the epoxy that is used to glue the can back together. Coat both sides of the card stock with lots of epoxy and fit the top back in place making sure that the marks on the can are in alignment. Wipe the excess epoxy off the outside of the can. Wrap the can with masking tape to hold the two pieces in alignment until the epoxy sets up. Paint the glue joint with silver paint to hide the seam. This isn't a perfect, undetectable rebuild of the B+ filter cap but it makes the installation of new electrolytics much neater. The tub mount 10uf electrolytics do not use PCB oil but are filled with the old black tar so rebuilding is easy. An old style, really large, high wattage soldering iron with the huge one-inch wide size tip is required. These old behemoths transfer enough heat to remove the bottom plate by melting the solder and prying up the bottom plate, one side at a time. Once the plate is off, dig out the tar and the old capacitor and replace with a new electrolytic as shown in the lower photo right. It's not necessary to replace the bottom plate. This process is next to impossible without using a very large soldering iron. If you don't have one, just replace the old tubs with new electrolyics installed on new tie strips for the bias supply and at the existing tie point for the driver tube and at the 6V6 tube socket for its cathode by-pass. Wiring Harness and Soldering - Be sure to check over the condition of the wiring insulation under the chassis. The wire insulation on early SP-600 receivers is rubber-like and covered with cloth. It seems that the cloth, which probably has fiberglass in it, is prone to fraying and disintegrating depending on the amount of rework and the storage conditions that the receiver has gone through in the past. Later SP-600s use wire that doesn't have the fiberglass strands and is more like standard hook-up wire. Also, check all of the soldering rework that was done in the past. The quality of the rework can vary dramatically from receiver to receiver. Resolder any suspicious looking joints. Sometimes you will even have to strip and tin new leads on the wires that have had too much stress and breakage during the past reworks. Tubes & Tube Shields - It's obvious that all of the vacuum tubes need to be tested and replaced as necessary. Weak or marginal tubes will compromise the receiver's tremendous performance capabilities. However, don't rely entirely on the tube tester. Proper operation of the receiver is the final test for the tubes. Although uncommon, you may find tubes that test fine in the tube tester that are noisy or might have problems that only show up after 10 or 15 minutes of operation. Clean all tube sockets with De-Oxit as you re-install the tubes. 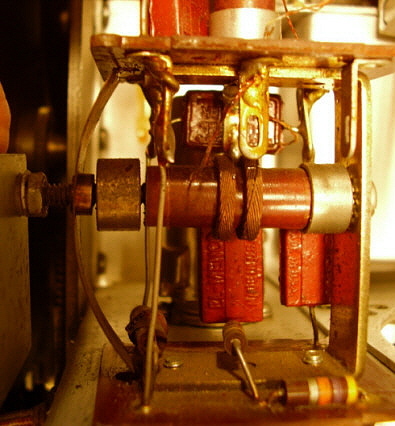 The LO tube, a 6C4, has a special tube shield that has a grounding extension that is connected to the front ground binding post terminal on the top of the tuning condenser shield. The other tube shields are standard nickel plated types made by various manufacturers. The heat conducting black IERC type tube shields can be fitted to the SP-600 tubes and they do lower the tube temperature which results in longer tube life. 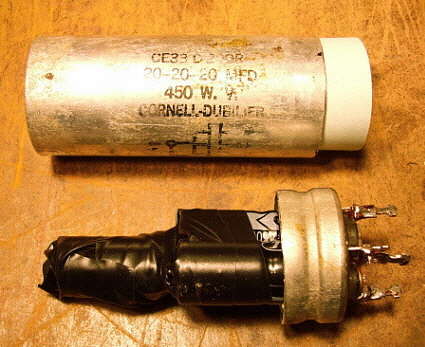 Many SP-600 receivers were fitted with the IERC tube shields during their active use with military and commercial users. The Hammarlund manuals always show the old nickel plated, high heat-retaining types of tube shields because they were the original type supplied with the receiver. BFO Repairs on the "JX" Versions - The BFO usually doesn't have any serious problems but if anything does develop, getting into the BFO can is a real headache if the receiver has the "JX" option. Of course, the time to thoroughly check out the BFO is when the receiver is disassembled for the rebuild. But if a problem develops afterward, you'll find it's impossible to easily access the BFO coils and circuitry inside the can because the Selectable Crystal Controlled Oscillator has a switch shaft that is directly over the BFO can. Even if you remove the shaft, you still can't get the BFO can off. To gain access to the BFO coils and other components for repairs first remove the side panel of the receiver. Next, under the chassis, unsolder the four wires that connect to the filter capacitor and filter chokes. Now, remove the screws that hold the filter choke platform to the chassis standoffs and remove the assembly. Now, remove the four screws that thread into the standoffs that mount the Crystal Controlled Oscillator and move the unit back out of the way. It isn't necessary to unsolder any of the wiring to the Crystal Controlled Oscillator. You can now remove the BFO can and proceed with any repairs. When the BFO repairs are complete, then reassemble the receiver enough to allow power up and testing. If the BFO functions correctly then complete reassembly. 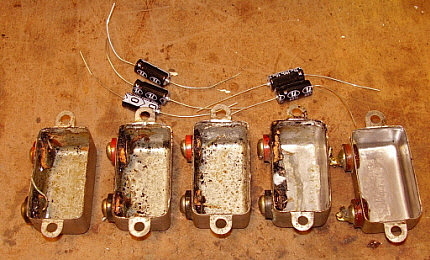 Shown in the photo to the left is the BFO from the JX-21 receiver. I had noticed that the BFO wouldn't hold alignment and many times when turning the BFO knob, the BFO frequency wouldn't change. As can be seen in the photo, the metal end cap that has the threaded rod passing through it had become detached from the coil form. This allowed the blade spring which provides an end load on the slug adjustment to become fully extended. This resulted in erratic movement of the slug and BFO frequency. The repair was to reattach the end cap using epoxy making sure that the end cap was fully seated onto the coil form and held in place while the epoxy cured. On "non-X" optioned receivers, working on the BFO is easy only requiring removal of the side panel for good access and visibility. Then removing the BFO can to observe, repair and test. photo left: The BFO from the JX-21 receiver showing the detached end-cap and that the blade spring load is fully extended. Major Modifications - The SP-600 was an expensive receiver that was normally used either by the military or by commercial users. It's performance is legendary. It isn't usually found with extensive modifications installed. However, most SP-600 receivers have gone from former owners that didn't usually install undocumented modifications to new owners - hams. Some hams still seem to relish the idea that they can "out-engineer" the Hammarlund engineers. Most of us know from experience that extensive ham modifications almost never function better than the original circuit that was designed by a team of professional radio engineers. Almost all ham "major" modifications are poorly installed. Almost all ham modifications tend to enhance one area of performance at the expense of performance in another area. Additionally, ham modifications are rarely documented so their design intent and expected improvement is usually a mystery. I always try to return the receiver circuitry to the original design and layout. I always try to use components that are the same values and ratings as the original. It is acceptable to replace a 10% resistor with a 5% - but not vise versa. Replacing the molded capacitors is the exception and, when replacing the molded caps, be sure to use all the same type of new capacitors - it looks like a professional rework job then. I have found through restoring many communications receivers that the original design works best and many functional anomalies can be avoided by adhering to the original component type, original placement and original wiring layout. Once the receiver is returned to original, now all of the original documentation - no matter where it comes from - can be used and will be accurate for all future users of the receiver. Additionally, the manual's operational instructions will be accurate and the receiver will perform as described in the manual. Major Audio Modifications - The Argument Against 'em - The audio output on the SP-600 is communications-grade with the bass rolled off at about 3db down at 125 hz resulting in a noticeable lack of bass response. Just how much this absence of bass response bothers the user is certainly subjective but Hammarlund engineers had good reasons for the original audio response shaping. The SP-600 was designed as a communications receiver and as such it must perform that function equally well in all modes of reception. While it might be pleasing to listen to an AM BC station with a bass response that goes subterranean, this type of response is a hindrance to good CW copy. Additionally, RTTY and other data modes are adversely affected with an audio response that over-emphasizes the bass. Certainly SSB communications was developing while the SP-600 was in production and, while the demodulation of a SSB signal was probably not a major consideration during the design stages, SSB intelligibility is certainly better without significant bass enhancement. The SP-600 owner should be aware that AM reception was just one of many communication modes that the Hammarlund engineers had to consider while designing the receiver. A minor reshaping of the audio can be accomplished without limiting the SP-600's ability to demodulate CW and SSB signals. Paralleling the two 5100pf coupling capacitors in the audio section with .01uf capacitors then paralleling the audio output tube's cathode bypass with a 10uf electrolytic and adding a 10uf electrolytic in parallel with the 1st AF Amplifier's 1K cathode resistor will give the audio output a response that sounds like a typical, older communications receiver. This simple approach will satisfy most users that feel that the original roll-off of the bass was excessive and it doesn't affect the ability of the SP-600 to function normally in the CW and SSB modes. Body and Panel Work - Many SP-600 receivers have been roughly handled during the last few decades of moving and storage. Consequently, you might find bent panels, chassis or broken parts in general. Most of the straightening of panels is common sense and routine. It normally involves removing the bent part and using either auto body techniques or using a non-marring hammer to straighten them. The front panel is heat-treated aluminum and, if bent, is more difficult to straighten than would be expected. Still,...it will "straighten." Install ALL of the Screws - The SP-600 uses a lot of screws to mount various shields, panels and other assemblies. All of these screws are important for mechanical stability and for shield electrical connections. It is very common to find an SP-600 missing many of the screws for these parts. Most "hamsters" think that only two screws are required to mount panels (one screw, if it's really tight!) ALL of the screws are necessary for the receiver to have its mechanical strength and stability, so be sure to install all of the screws and replace any that are missing. Tuning Mechanism and Chronic Dial Slippage - The SP-600 tuning works by friction only. There are gears to rotate the tuning condenser but the main drive system is entirely by friction of brass-on-brass wheels. There is a load spring in the shape of an "S" that provides enough pressure to ensure good frictional drive. Essentially, the tuning knob shaft rotates a drive wheel that in turn drives an idler wheel that is grooved. The logging dial rim makes contact with the idler wheel's groove and that rotates the logging dial which then via it's hub drives the rest of the tuning gear system. Everything depends on good contact, clean surfaces, proper loading and that the metal surfaces are not "polished" by wear. It's common to find the tuning mechanism dirty and many times this is what is causing the tuning slippage. Remove the front panel along with the main tuning dial, the logging dial and the band indicator dial. Spray the brass gears with WD-40 and work the dirt out with an acid brush. WD-40 is cheap and a good de-greaser. Dry any WD-40 residue with paper towels. When clean and dry, lubricate only the bronze bearings - sparingly, they are oil-impregnated but a drop or two of 10W machine oil will help since most of them are over 60 years old. The brass gears really don't need lubrication and too much oil or grease on the gear teeth are just "dust traps" that end up causing wear and other problems. Be sure to clean the rim of the logging dial with denatured alcohol. Sometimes you'll find the the rim of the logging dial has a thin film of grease on it. This will cause slippage when tuning. The rim of the logging dial must be super-clean. Additionally, the rim-surface of the logging dial must be "perfect." In other words, the can't be any dents, warps, gouges on the rim. In addition to a visual inspection, be sure to run your finger tip along the rim to see if you feel any imperfections. Any rim issues need to be corrected by lightly using a very fine file to dress down the imperfection so the surface is even and smooth. When dressing down the imperfections be sure to maintain the proper shape of the dial rim and don't remove any material other than the defects. Clean the rim afterwards with denatured alcohol. The contact areas where the drive wheel engages the reduction wheel and the groove where it engages the logging dial rim must be super clean. Clean all of these brass wheels thoroughly with denatured alcohol. Again, check these mating surfaces for imperfections and correct any that are found. Usually the drive wheels are in good condition but it depends on the condition of the receiver and how it was stored. Reinstall all three dials. Inspect the logging dial and how it fits into the drive wheel groove. Check the tuning action. It should be super-smooth. Once in a while, after cleaning, there might still be some tuning slippage. At this point, you might suspect the "S" tensioning spring that loads the drive wheel against the rim of the logging dial. The "S" spring sometimes looses its "springiness" but you can remove the "S" spring and bend it outwards to increase the loading then re-install it. Sometimes the "S" spring has just "had it" and it needs to be replaced with a new one (or a good one from a parts set.) Most of the time the "S" spring is okay and other problems are causing the slippage. If you've tried everything,...thoroughly cleaning, checking the logging dial rim, readjusting the "S" spring and the dial still slips,...then the problem is likely excessive polish on the surface of the logging dial rim due to wear. If the slipping is still present, then apply a solution of rosin and denatured alcohol (about the viscosity of water) into the groove of the drive wheel using a small paint brush. You don't need much, just brush a little of the rosin-mix into the groove. Rotate the dial using the tuning knob to transfer the rosin solution on to the dial rim and then let the solution dry (alcohol evaporates.) The "grip" of the rosin will assure that the dial will not slip anymore. If in the future the rosin seems to loose its grip, just reapply the rosin-mix to the drive wheel groove and tune the receiver to transfer the rosin to the dial rim. Easy. If you have trouble finding rosin powder, try using a rosin block that's for a violin bow. Just use a small file and file a small amount of the bow rosin into a cup. Add a little denatured alcohol and stir until the rosin is dissolved in the alcohol. The viscosity of water is about right. If you don't know anyone that plays a string instrument, then try buying a rosin block at a musical instrument store. When everything is "right" with the tuning mechanism its operation is better than "velvet smooth" and there will be no slipping of the dial drive. The Antenna Input Twin-ax Connector - Most of the SP-600 receivers were equipped with a UG-103/U twin-ax Antenna Input connector mounted on top of the RF Platform. The mating connector, the PL-102 (identified as UG-102 in the SP-600 manuals,) is not something that every ham had lying around in their junk box. Consequently, many SP-600s have had their UG-103/U replaced with a standard (read - "easy to find") SO-239 UHF type coax connector. The original SP-600 design concept was to use RG-22 balanced coax (twin-ax) for dipole antennas and since this was 95 ohm Z line, the match was fairly close. Nowadays, few (if any) hams run twin-ax because the losses are so high. So, if you are going to utilize your ham station transmitting antenna for the receiver antenna, you'll end up with standard unbalanced coax running to the SP-600. You'll have to ground one of the twin pins in the PL-102 connector for proper unbalanced operation. It doesn't matter which pin is grounded, just so one of them is. This can be done by soldering a wire from the coax shield up to one of the twin pins. I don't advocate replacing an original UG-103/U connector but, if it's already replaced, once the mating coax connector is hooked up, you can't really tell if an SO-239 has been substituted for the original twin-ax connector. Additionally, the right angle UHF adapters are a lot easier to find than the twin-ax right angle adapter, the UG-104/U. If you use small diameter coax, like RG-58 or RG-8X, you don't really need the right angle adapter since the coax is flexible enough to make the bend to allow it to exit out the "antenna hole" in the original cabinet. If you are rack mounted or without a cabinet then there will be no problem with the antenna coax at all. NOTE on UG-103/U versus SO-239: I received an e-mail from Hammarlund SP-600 historian Les Locklear that provided information that Hammarlund approved the substitution of a SO-239 for the UG-103/U in a revision sheet dated September 13, 1951. SO-239 receptacles appear on receivers as early as the SP-600 JX-8 versions. The conclusion is that after 1951, it is possible to find a SP-600 with a SO-239 antenna receptacle that is an original installation. photo above: The original antenna connectors for the SP-600. 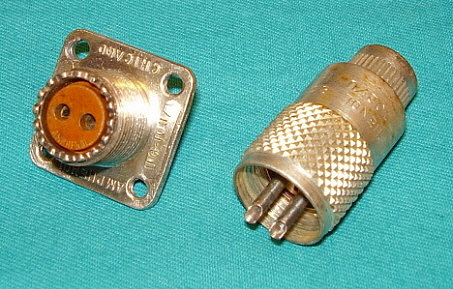 The UG-103/U twin-ax receptacle and the PL-102 (UG-102) twin-ax mating plug. The IF Section - The IF is straight forward in alignment except for the second conversion frequency adjustment of 3.955mc. This requires the 455kc IF to have been very accurately aligned since the conversion oscillator mixes with a 3.500mc signal to create the 455kc IF. Center the IF using the Crystal Filter crystal frequency and you'll end up very, very close. Be careful on the 3.955mc adjustment of T-1. It is possible to adjust this to a harmonic and everything seems okay - until you try to operate the receiver above 7.4mc and the instability lets you know something is wrong. Also, the Crystal Filter adjustment of T-3 can be adjusted to a harmonic with the result that the Crystal Filter won't resonate correctly. This is a common problem on some SP-600 receivers. Check the height of the adjustment screws on all of the IF adjustments and be suspicious of any adjustments that "peak" when they are at the limits of either end of adjustment. Crystal Filter - This circuit seems to have a lot of critics that claim it doesn't function very well, if at all. Most of the "does nothing" problems with the Crystal Filter operation can be traced to either poor alignment of the IF section or improper placement of the Phasing knob in relation to the phasing condenser's position. The IF alignment frequency must be determined with the Crystal Filter set to the sharpest position. It will probably not be exactly 455 kc but will be very close and this is the frequency that all of the single conversion IF transformers are adjusted to. Align the IF with the selectivity in the 3kc position. To set the Phasing knob's position, inject an unmodulated 455kc signal into the 1st Mixer stage. Don't over-drive the IF with a strong signal. Switch to CW and tune the BFO for about 1kc audio output, set the selectivity to 0.5kc and then rotate the Phasing control slowly. When rotating the Phasing knob, you'll notice that the selectivity varies from wide to very narrow and near the narrowest position you'll eliminate the 1kc tone. Set the Phasing knob so that the widest bandwidth is at 0 and the narrowest is at 10. Elimination of heterodynes will occur around 8 or so on the Phasing scale. The "diamond" mark on the Phasing scale indicates mid-range on the selectivity. Still, with all this consideration,...the Phasing action is subtle. The RF Section - The RF adjustments are accessed through eight holes that are located on the RF Platform. Each of the holes is covered with a 3/8" diameter hole plug that has to be removed - they just snap in place and are easy to remove. A long alignment tool is necessary to reach the adjustments that are actually on the turret band switching assembly. The alignment tool should be non-metallic to avoid de-tuning the LO on the higher frequencies. Most of time I need a small flashlight to peer down the alignment hole and see the L or C adjustment screw so that I'm not poking around trying to "feel" when the alignment tool engages the adjustment screw. It is possible to actually engage one of the slots in the tensioners and then loosen it up so the screw adjustment isn't capable of holding a setting. Better to look and make sure of proper engagement of the adjusting tool. A 100 ohm resistor has to be used in series with the RF Signal Generator so the load Z remains higher than 100 ohms. This allows the 1RF amplifier stage to be set for the 95 ohm twin-ax but it is also close enough for matching up with most antenna loads. Remember, the SP-600 doesn't have an Antenna Trimmer, so you have to be careful in presenting the right Z load to the receiver input. The SP-600 alignment instructions tell you to start with the lower end of the tuning range and adjust the L but I have found that this method results in a lot of readjustment back and forth between the upper and lower ends of the range. It's better to start at the high end of the range and adjust the C and then proceed to the lower end and adjust the L. This usually only requires two back and forth adjustments. What is really nice about aligning the SP-600 is that all of the adjustments are done from the top of the chassis - no need to have the receiver on its side and have to look at the tuning dial sideways.